Elsewhere is a living museum using the massive collection of a former thrift store to build futures from old things and generate collaborative creativity in the downtown neighborhood of Greensboro, NC and across the world. I did a month-long residency there in June 2012. An odd pre-existing fascination with all things flesh magnetically drew me to the dolls. Their naked pinkness piled high in the Toynado detritus just begging to be touched, but in the subtlest and most pitiful of ways. Dolls are meant to be played with. They are mini fake humans designed for imaginative interactions. But the dolls I discovered had been hidden away from sight for quite some time. Their dismembered limbs gathering dust in the corner – a morbid mass grave for playthings of the past. In such a place as Elsewhere, a living museum, a breathing organ of objects always in flux, nothing, no matter how beaten and broken, deserves to be hidden way. My project has been a joint attempt to enliven both the dolls and the place in which I’ve chosen to install them – formerly known as the hotel lobby – an underutilized light-filled area on the 2nd floor at the front of the building. This space will now function as both lounge and creative work area, a space for gestation and growth of all kinds. One of the many reasons I am so drawn to the flesh as both material and metaphor in my work is because of its regenerative qualities and capabilities. It serves as protector and barrier from outside dangers, as well as our primary sense organ, allowing us to feel and respond to the world around us. 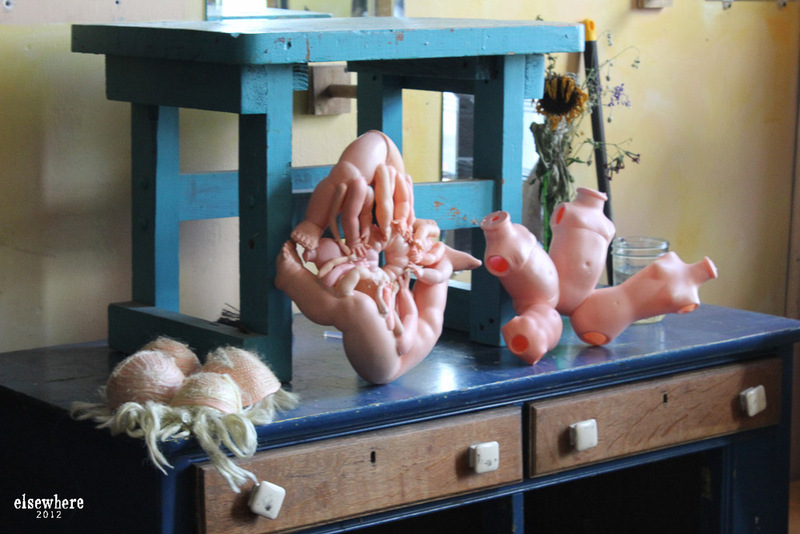 In this project, I have endeavored to work and play with the doll parts, the imitation flesh, to enliven it so that it may mimic human flesh not only in form, but also in manner, fostering growth of new projects and ideas. The dolls have said goodbye to their old lives as objects and playthings. Their individual identities have been dissolved in attempt to further a collective consciousness, a collaborative ascension that is equally weird, hopeful, playful, and macabre. As their parts rearrange and flow in unexpected formations, viewers are encouraged to explore with child-like curiosity and discovery.